I have always, ever since I started photograhing with a DSLR, wanted to sell my photos. It’s been in the back of my head, but I’ve never really acted on it. Once I created an account on Etsy, but after I’d created it, nothing happened. 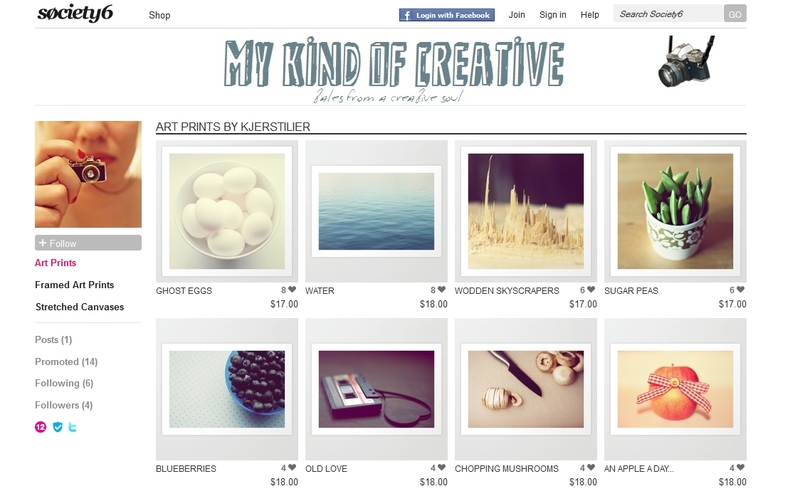 A few weeks ago, a flickr friend, joined Society6.com, a place where you can sell your art. For two weeks I’ve been playing with the idea of doing the same. Yesterday I investigated the site, to see what it was like / how it works. To my satisfaction, it works just the way I want it. I upload photos I want to sell. The quality of the photo (size etc) decides in which resolutions the photos can be sold. I pick the price I want the photo to be sold for. The great thing, is that I’m not the one who prints and sends the photo, Society6 does. They charge what it costs to print it, pluss a little handeling fee. So I have to take that into concideration when I set the price. So I decided to try it myself. It took me a minute or so to set up the shop; a bit longer to make and upload a header. I’ve gone through my photos taken the last years, trying to decide what I want to sell. I not only have to think of what I want to sell / what I think is a great photograph, but also what potensial buyers want. I knew right away that I wanted some food shots. In addition to some food shots, I’ve also added a few other shots. There is a limit on how many photos I can upload each day it seems, so I haven’t been able to add much. It will come, in time. I don’t have any illutions about making big money on this shop; it’s mostly for fun. But I can’t help but feeling a little joyful about this shop; no matter how small and one in a million it is. If you want to visit my shop, go here. 2 responses to My shop is open! Thanks for the info. I just opened my own shop there and was smacked with the upload limit, too. Hmm. Anyway, I’ll head on over to your shop! All the best!